An Embraer ERJ-190 passenger plane, operating flight TM470 from Maputo, Mozambique to Luanda, Angola, crashed in the Bwabwata National Park in Namibia. The airplane was destroyed and all 27 passengers and six crew members were killed. The flight departed Maputo at 11:26 local time (09:26 UTC) and was scheduled to land at Luanda at 14:10 local time (13:10 UTC). The airplane proceeded over Botswana at FL380 and was in contact with Gaborone ACC. At the EXEDU waypoint, about 13:09 local time (11:09 UTC), the aircraft commenced a sudden descent, which continued until the airplane impacted the ground at 11:16:26 UTC. Minutes before the crash the co-pilot left the cockpit for the lavatory. The captain then manually changed the altitude preselector from 38,000 feet to an altitude of 4,288 feet. This was changed to 1,888 feet and then to 592 feet. The auto throttle was manually reengaged and throttle lever then automatically retarded and set to idle. The airspeed was manually selected several times until the end of the recording, which remained close to the Vmo (maximum operating limit speed). During the descent the captain used the speed brake handle to activate the spoilers. On the cockpit voice recorder sounds were heard of someone pounding on the cockpit door. It was discovered that the captain went through numerous life experiences ranging from uncompleted divorce process, the suspected suicide of his son on November 21, 2012 and a recent heart surgery of his youngest daughter. The inputs to the auto flight systems by the person believed to be the Captain, who remained alone on the flight deck when the person believed to be the co-pilot requested to go to the lavatory, caused the aircraft to departure from cruise flight to a sustained controlled descent and subsequent collision with the terrain. The non-compliance to company procedures that resulted in a sole crew member occupying the flight compartment. 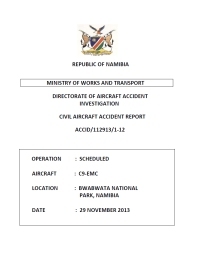 DAAI recommends that Mozambique Civil Aviation Authority should come up with a mechanism to ensure that the procedure of two people in the flight deck is adhered to at all times as laid out in LAM’s Manual of Flight Operation Chapter 10.1.4, Page 5 of 36, Edition 3 Revision 8, (Absence from Flight Deck). DAAI recommends that ICAO should establish a working group that should look into the operation and the threat management emanating from both side of the cockpit door. DAAI recommends that ICAO should establish standards that implement recommendations of the working group, formed under safety recommendations number 002/2015 LAM to suitably avert the locking out of the cockpit of authorized crew members. DAAI recommends that ICAO should establish a working group to review the installation of visual recording inside and outside the cockpit that should provide information on who was in the cabin, who exactly was controlling the plane at the time of the accident and even where their hands were in relation to the plane’s controls. DAAI recommends that ICAO should expedite the implementation of international requirements on global tracking of airline flights providing early warning of, and response to, abnormal flight behavior information to ensure that search and rescue services, recovery and accident investigation activities are conducted timely. DAAI recommends that ICAO working group (Global Tracking 2014-WP/6) speeds up the research and implementation of aircraft tracking and localization other than ELT system. Distance from Maputo International Airport to Luanda Airport as the crow flies is 2778 km (1736 miles).